Is it possible for a white girl from a middle class village to experience discrimination? A little while back, I read my friend Pavla’s blog Small is Really Beautiful and it got me thinking about my own childhood home. It was so interesting to read her views on racism in my own country. I lived in a small affluent Surrey village between ages 9-18, in the only social housing in the village. As a teenager I found it very isolating as the “council house” kids were not considered appropriate friends for other wealthy villager’s children. My school was miles away, as was the nearest town. Transport out of the village was a single bus daily, miss it and you had a long walk! I hated it! Without a doubt I have been discriminated against as a single mother. There will always be some article or report somewhere blaming a heap of issues on broken homes and single parents. Even people who I thought were friends distanced themselves when I became single. It’s my experience that any small “difference” from the norm will get noticed, discriminated against or become the target of bullies. My son has been bullied at school because of his autism. My daughter has been isolated at University by a group that quite literally tormented her because of her drive and determination (she didn’t want to take part in the constant drinking). I have a few questions for you all. What is the difference between bullies, racists, homophobes, misogynists and the like? Are they simply people who never outgrew the playground? Do they ever choose to grow up and think about their past and change or apologise? Would you agree that education is the key? I think it is, but not formal education. It’s OUR responsibility as parents to teach our children respect for all human beings. To help them find the joys of being with people with different outlooks and experiences. Help them to learn that, for the most part, each individual wants a good life just as we all do. The countries that we wage war with – they have people there with families too, just the same as you and I. My life has been enriched by people who are categorised as foreign, gay, autistic, disabled, but to me they are just my friends and family. …she doesn’t realise that she already has. This has to be one of my favorite photographs of her, barely two weeks old, beautiful chubby cheeks, arms in 5th position – very telling! Four years of infertility treatment was exhausting and soul destroying as anyone who has experienced it will tell you! 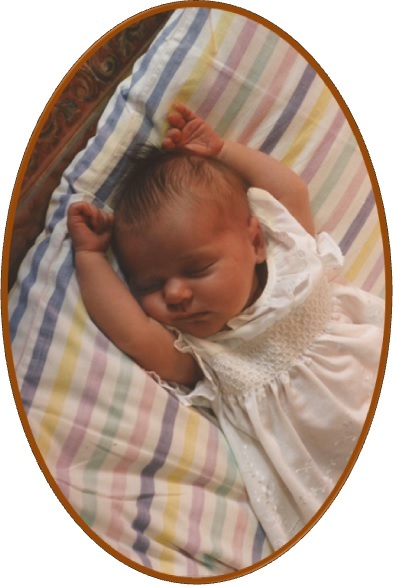 She was conceived naturally following a decision to have a short break before trying IVF. That alone changed my world. Her pacifistic tendencies were at work early on in her life. My parents, who divorced some years earlier, decided whilst passing each other in the hospital corridor that they would put their differences aside for the greater good of this beautiful human being. That also changed my world and that of my parents, sister and the rest of our family. She has taught me many things throughout her life so far and the ripple effect just keeps on going. I watch with immense pride as she matures into a beautiful young woman. I’ll reach the shore at last. I read this (or at least tried to) at my Father’s funeral. I had experienced grief before, but nothing like this. My Dad always had the solidity that I valued, he was a rock. My sister spoke about him at the funeral too and one thing that struck me was that we had both had very different relationships with him! I didn’t recognise the man she was talking about at all. He was not present in my younger days in the same way that he was in hers – there is eight years between us – but nonetheless, I knew that he loved me. Four days before he died he phoned me on my birthday to wish “his baby” a happy birthday. I don’t remember him ever being so softly spoken or gentle of voice. He was a big man, ex boxer, ex Army and manual worker, it just wasn’t his way. It left me puzzled at the time. And by the way…I was 42! What I am feeling now 10 years later, for someone else, is grief. A very different kind of grief. It’s ambiguous. Why do I grieve? It’s uncertain. Are you dead or somehow still alive?